As a customer of the District, you receive a high quality product that meets every federal and state standard for drinking water. View the most current report. To ensure that tap water is safe to drink, the EPA prescribes regulations to limit the amount of certain contaminants in water provided by public water systems. Food and Drug Administration (FDA) regulations establish limits for contaminants in bottled water, which must provide the same protection for public health. Drinking water, including bottled water, may reasonably be expected to contain at least small amounts of some contaminants. The presence of contaminants does not necessarily indicate that water poses a health risk. More information about contaminants and potential health risks may be obtained by calling the EPA’s Safe Drinking Water Hotline, 800.426.4791, or visiting their website. M.U.D. adds fluoride to its treated water to promote dental health. Fluoridation was approved by Omaha voters in 1968. In 2008, the Nebraska Unicameral passed LB 245 which requires all Nebraska cities and towns with populations over 1,000 to add fluoride to public water systems. Both the Missouri and Platte Rivers have naturally occurring fluoride in the range of 0.3 to 0.5 parts per million (ppm). The District adds enough fluoride to make the tap water concentration approximately 0.8 ppm, well below the federal limit of 4.0 ppm. Questions about drinking water? Call the EPA Safe Drinking Water Hotline at 800.426.4791 or go to their website. Chloramines, a combination of chlorine and ammonia, are used to kill potentially harmful bacteria in the water. Approximately 20 percent of water supply systems in the U.S., including Council Bluffs and Lincoln, use chloramine as a disinfection agent. M.U.D. changed the water disinfection process at its water treatment plants January 21, 2003 to ensure your drinking water continues to meet U.S. Environmental Protection Agency standards for drinking water. Previously, we used chlorine for both primary and secondary disinfection in the water treatment process to guard against bacterial growth in the distribution system. Like many other communities, we experienced elevated levels of trihalomethanes (THMs) with chlorine as a disinfectant. THMs are a suspected carcinogen (cancer-causing agent), created in small amounts as a by-product when natural organics in water combine with chlorine. The U.S. Environmental Protection Agency (EPA) lowered the standard to 80 parts per billion January 1, 2002, as the maximum level of THMs allowed in drinking water. Our treated water averaged 74 parts per billion. The District may have exceeded the new standard on occasion with only chlorine as a disinfectant. The EPA recommends chloramines as a disinfectant and as a way to avoid THM formation. Chloramines insure water remains bacteria-free for a longer time period than chlorine. With chloramines, we expect the THM level to average 40 parts per billion. Chlorine continues to be the primary disinfectant. Chloramines are used for secondary disinfection. Estimated costs to use chloramines are $3.7 million for capital improvements and $200,000 per year for operation costs. Customers can find out if they have a lead service line by contacting Customer Service at 402.554.6666. To reduce the chance of exposure to lead only use water from the cold tap for cooking and drinking. If the tap has not been used in more than a half hour, flush water through the faucet for 30 seconds to a minute before using it. Also remove and clean the aerator on the faucet on a regular basis. Results for Lead and Copper Rule compliance are available in our annual water quality report. The most recent round of lead and copper testing was completed in August 2016. The 90th percentile (action level) was 6.38 ppb, well below the regulatory limit of 15 ppb. The U.S. Environmental Protection Agency and Nebraska Department of Health and Human Services (DHHS) approved our sample locations. 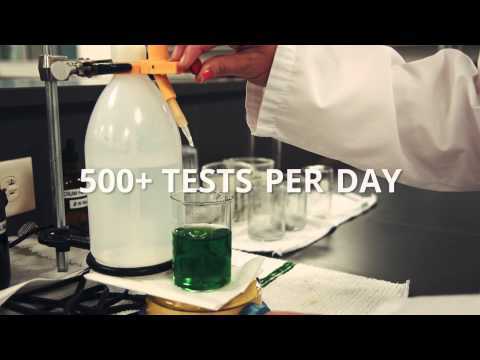 The DHHS laboratory actually performs the testing for lead and copper. Is there lead in M.U.D.’s water? No. M.U.D. conducts monthly tests for lead and it is not detected in source (raw) water, in the finished water from the District’s water treatment plants, or in the distribution system (water mains). M.U.D. produces stable, non-corrosive water. Lead is mainly a localized customer issue, which means some customers may own a lead service line or have plumbing that includes lead solder. Lead service lines may be found in areas of Omaha and other communities on our system in homes built prior to the 1930s. How do I find out if I have a lead service line? The pipe that connects your household plumbing to the water main in the street is called a service line, which you own. M.U.D. customers can call Customer Service at 402.554.6666 to find out what the District’s records indicate about their service line material, or you can hire a licensed plumber to inspect the service line. Yes. Customers who have partial or whole lead service lines (or the composition is unknown) installed before 1940 can request M.U.D. to test for lead. To request a test, call Customer Service at 402.554.6666. 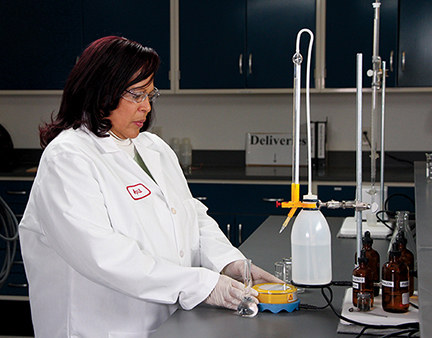 M.U.D.’s Water Quality Lab conducts the tests and submits results to the Nebraska Department of Health and Human Services (DHHS). In addition, M.U.D. has an agreement with Omaha Healthy Kids Alliance to test the drinking water in homes where there is a concern for lead. If I do own a lead service line, what can I do to reduce lead exposure? Only use water from the cold tap for cooking and drinking. If the tap has not been used in more than a half hour, then flush water through the faucet for 30 seconds up to 2 minutes before using it. Remove any sediment (mineral or rust build up) on the screen and other parts. If necessary, soak the parts in white vinegar for a few minutes and scrub with a brush. Reassemble the screen parts and re-attach to the faucet. Use of a supplemental filter is a personal preference, however it can also be harmful if not properly maintained. In selecting a filter, determine what substance(s) is/are to be removed and look for a filter that has a NSF/UL certification to remove it. Information on plumbing fixtures and in-home filters is available from the National Sanitation Foundation by calling 1.800.NSF.MARK or visiting www.nsf.org. Does the Federal government monitor water for lead? Yes. In 1991, the EPA published a regulation to control lead and copper in drinking water, known as the Lead and Copper Rule. The EPA revised the regulation in 2000 and 2007. Congress has also set limits on the amount of lead that can be used in plumbing products. These requirements were first enacted in 1986 and then reduced to lower levels in 2011. DHHS performs all of the testing for M.U.D.’s compliance with the Lead and Copper Rule. M.U.D.’s role is to deliver the sample kits to the customer, collect them and send them to DHHS for testing. M.U.D. is required to sample for lead and copper every three years. The most recent round of lead and copper testing was completed in August 2016. The 90th percentile (action level) was 6.38 ppb, well below the regulatory limit of 15 ppb. You can call the EPA Safe Drinking Water Hotline at 800.426.4791 or visit their website: http://water.epa.gov/drink. Or, call the Nebraska Department of Health and Human Services Division of Public Health, Office of Drinking Water, 402.471.2541. The Nebraska Department of Environmental Quality (NDEQ) completed the source water assessment which includes a wellhead protection area map, potential contaminant source inventory, vulnerability rating and source water protection information. In 2013, to better protect the quality of the water in our well fields, we completed wellhead protection plans for our Platte South and Platte West well fields. Wellhead protection is the management of the land surrounding a water supply well to prevent contamination of the water supply. The plans provide a detailed account of the potential threats to the facilities and a summary of existing and recommended management strategies. To view the source water assessment report or the wellhead protection plans visit the Water Quality page and search for the files in the Related Resources box. If you have additional questions, please contact Customer Service at 402.554.6666 or e-mail customer_service@mudnebr.com. Does using a home water treatment device guarantee my water is safe? No. The U.S. Environmental Protection Agency does not recommend home treatment devices as a substitute for public water treatment because of the difficulty in monitoring their performance. Home treatment devices are not tested or regulated by the federal government. Some, however, are tested by independent laboratories. If you want to use a water treatment device, carefully choose one according to the water conditions in your area. Also, be aware that a device needs to be properly maintained or it could cause water quality problems.